So how is the International Aquatic Plants Layout Contest judged? As we await the winning images of the IAPLC 2013, Nathan Hill reflects on what it takes to become an aquascaping champ. Having now had the chance to pore over the results of this year’s IAPLC, I really must take a moment to congratulate the UK contingency for their superb efforts in this latest contest. Congratulations all! Having entered this particular event myself, I give huge kudos to the other 20 UK participants that took part, and with some magnificent results, praise is definitely due. Stu Worrall romped in as the head of the Brit crowd with 82nd place, out of a total of 2,164 entries from around the globe. Hot on his heels sits Eduard Gercog at 86th, with James Starr-Marshall taking the UK bronze status at 158th. Competition is fierce when people want to head up ADA’s prestigious contest, and looking at some of the other entries, I can see which themes do and don’t work now. After all, with Jeremy judging the top 100, I took the opportunity to indulge myself a very open browse of what makes the grade in ADA world. What didn’t surprise me was that the glut of top contenders appeared to be bigger tanks. Maybe we in the UK are at a slight disadvantage with financially inaccessible equipment, where so many of our Eastern counterparts have access to big gear and cheaper sundries. Either way, I noted that not so many tanks under 60cm made an appearance. As for nanos, there was a definite vacancy. As always the contest isn’t without a little contention and friction, and this year one surprise has been the disqualification of several tanks, including some very high rankers. Finalists in 27th, 29th, 114th, 130th and 708th were unceremoniously hoofed out in a shock announcement by the IAPLC administration. Their crime? They published images of their completed ‘scapes in a magazine in Thailand. Admittedly, there’s a little more to it than that, with ADA having separate Thai and Japanese branches, each with their own contests, so there is a degree of politics involved. But all of this opens up a few new questions about the procedures and just what can and can’t be submitted, and I would also have to assume that perhaps my own humble entrance is now equally disallowed, as I ran it in PFK some time before entering it to the comp. It also opens questions about what content ownership the IAPLC requires of its participants, and exactly what is signed over to the contest. I shall be looking in to this decision to see if I can gain clarification before submissions for the next competition begin. It also raises questions about what constitutes publishing, which is why I think some explanation from ADA might be helpful in easing prospective applicants’ minds. Does a small circulation magazine pose more of a threat to ADA than images bandied about, going viral and being profusely shared on Facebook or other social media? Evidently in this case it does, but I’m uncertain about the totality of the thought process behind this decision. Though actually, the idea of objectivity is a bit of a non-starter. Ultimately, this is ADAs competition, and all applications are subject to the tastes and whims of the judges. Yes, the numbers of judges have been gradually increased, but we need to remember that subjective universalisability is still not objectivity. An aquascape may be loved by one person but loathed by another. That is, simply put, the nature of the beast. All competition hopefuls are at the mercy of the panel, and if that leaves a bad taste, then don’t enter, I say. Personally, I appreciate the marking criteria, though they are slightly at odds with each other in some instances. For those not familiar, the marks are divided into six categories, each carrying different weights. First is 'Artistic impression', carrying a maximum 100 points. This, making up the largest chunk of the marks given, makes my point about lacking objectivity stark and apparent. Is art objective? God, no. People are like proverbial snowflakes where artistic taste comes in, and everyone is different. Some people adore technically adept oil paintings. Others like myself prefer graffiti. Some people like a bundle of sheets and a handful of apples in the corner of some gallery installation. So immediately, half of the total weight of the marking is based on what the judge perceives to be artistic. In a nutshell, you’re going in blind. The judge might loathe what you consider to be the height of art, and there’s nothing you can do to fight your corner. The remaining five categories are called the technical points, the first being 'Creativity', which carries a maximum 20 points. Again, this is as subjective as can be. Just what is creativity? I spent way too long looking at this single word as a part of my Philosophy studies, and the answer I reached at the end is that it’s as ambiguous and subjective as art itself. Of course, from the angle of the IAPLC, I read this to mean 'fresh' or 'different' but I could be wrong. The next technical point is 'Composition/Arrangement of plants for another 20 points. This one makes a bit more sense, and I understand it to mean that transition between plants shouldn’t be harsh on the eye – but then we’re back to being subjective again. How do we gauge what is pleasing to the eye? Damn. Category four, Balance between the fish and the layout design, worth another 20 points, is one area I definitely cocked up a bit, in submitting a tank without livestock at all. I noticed a lot of tanks falling foul on this point, from what I saw. Layouts with fabulous plants and hardscape were thrown by the almost angry presence of an oversized fish, like an Altum angel or a Discus. But at least I can see where this category is headed, to an extent. If you had a soft, tranquil Iwagumi scene, and then stuck in a small herd of Mbuna, it’d not be balanced that well. You might be able to argue it’s creative, but I doubt you’d find much sympathy. Category five for another twenty points is 'Natural atmosphere'. Well, don’t even get me started on natural. 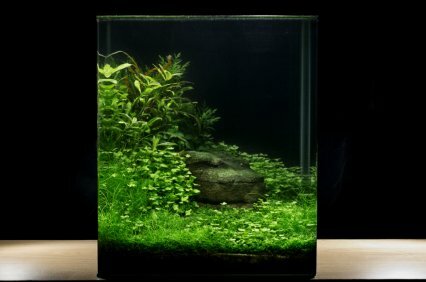 I recall making this point over a beer with some other aquascapers a while back. What is natural, exactly? I’m guessing here that the word means something closer to ‘wilderness’ because if it’s just natural in the strict sense then it includes everything inside (and outside, now I think of it) the universe. The only thing that wouldn’t be natural would be supernatural. Ergo, I’d be cost some points for submitting a ghost, but anything else would be fair game. For me, the word natural is another subjective, arbitrarily bandied term that is open to much interpretation. But then we have another issue on this category. How would one be particularly natural, or wilderness, whilst remaining creative? Well, I’ve seen a couple of entrances that managed just that. Especially this little number from Wang Chao that ranked at 107 - which to my mind is somewhat inspired. How this tank, based on my own subjective evaluation, didn’t make the top 10 is beyond me. The last category, 'Aquatic plants’ conditions and Time Progress of layout', for the final 20 points (200 in total, when all categories tallied up) leaves me frowning. 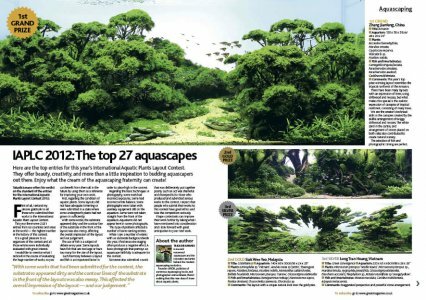 I’m assuming that what we’re looking at here is how the plants will fare up from the point of the photo onwards, something that Takashi Amano himself often made a big deal of in the Nature Aquarium World series of books. Plant condition is a no brainer, and if you’re submitting stripped stalks, algae smothered leaves and plants with obvious nutrient deficiencies, then you can rightly expect to lose marks. But the ‘time progress’ thing need a little explaining with some of the high-ranking entrances, I think. It also assumes something of a flawless foresight on the part of the judges, which is asking a lot. I certainly can’t look at a tank and say definitively if it’s going to look much better or worse in one year’s time. There are just too many variables. I’d be keen to know how ties are decided, too. Thinking about it, there are over 2100 entries, but only 200 potential points. It doesn’t take a maths genius to realise that an awful lot of the scores in there are going to be double ups – assuming that anything under the top 100 entries is rated that way. But then if they’re not, then there’s another host of confusion about how those top 100 are initially picked. Bear in mind that the ‘outsourced’ judges (of which Jeremy Gay is one) only get to see and rate the ‘top’ 100 from the submissions. At some stage, another 2000 tanks have already been ranked, based on criteria that none of us are really sure about. So out of those 2100, if they have been ranked accordingly, then there are a lot of tanks carrying the same score. I’d be keen to find out what the criteria are for ranking ties are in those circumstances. Another angle to note here is that a large core of the IAPLC committee are Far Eastern, or specifically Japanese. What we now encounter is a variation of context between our cultures. The differences between Western and Eastern cultures, outlooks and even approach to thinking are widely documented and studied. Further compounded by the transliteration differences between what ADA want of, say, an English judge and what they actually convey after language and contextual barriers, we could find a selection of judges working on widely different approaches. What I’m aiming at here is that there’s an awful lot of variables involved, especially where judges are concerned. With the slightly vague wording of the criteria that judges are supposed to be looking at, and the wide variability of tastes, I’m amazed that the final selections are as consistent as they are. But like I’ve said, I’m not questioning that. I’ve just spent the whole blog arguing why I think that the competition is entirely subjective. What that doesn’t do is undermine those top three British tanks I flagged earlier. Subjective or not, those tanks looked superb, and I have to agree with the judges that they really deserved to be up there. And will I be entering again, despite my nosedive of a score? Hell, yes! I’m sizing up gear and plants in the background as I write this. I love this gig!